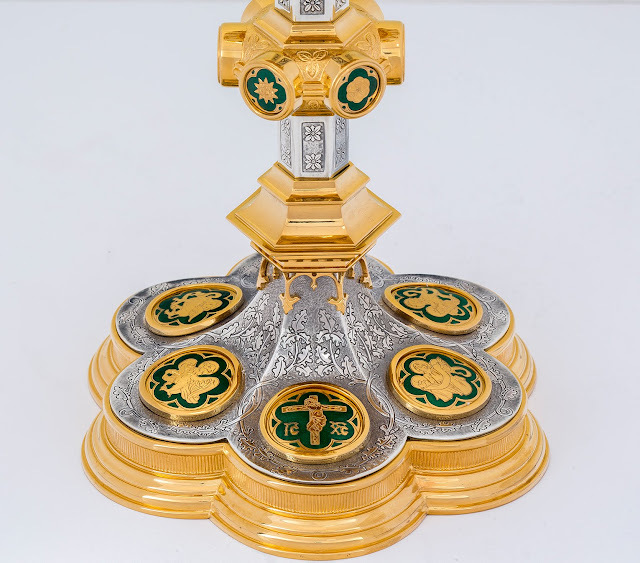 Church plate in its most winning iterations has always been marked by an effective melding of formal requirements of the liturgy with sophisticated craftsmanship; sensitivity to the artistic manner of the time with an authentic religious fervor. Best chalices, patens, and ciboria, aim beyond precious materials or expert design, skilled fabrication and functionality, although it is precisely these qualities that make such artifacts appreciated and memorable. All objects of liturgical art directly engaged with the Holy Sacrifice of the Mass should assimilate as effortlessly as possible with the formality and content of ceremonies, ennobling rituals with their high aesthetic merit. Through transcendent power of beauty, integrity of design, and quality of craftsmanship, liturgical art will facilitate both the priest and the faithful to enter more easily and more deeply into the Mysteries of the Faith and to find both repose and delight therein. This intended ideal role of church plate should regulate other factors relevant to its commissioning and fabrication, such as functionality, quality of materials or incorporation of art-historical developments. In 2017, Granda Workshop in Alcala de Henares, Spain received two exceptional commissions for church plate inspired by designs of A.W. N. Pugin (1812 – 1852) who is an exemplary figure in the history of Christian art and architecture. 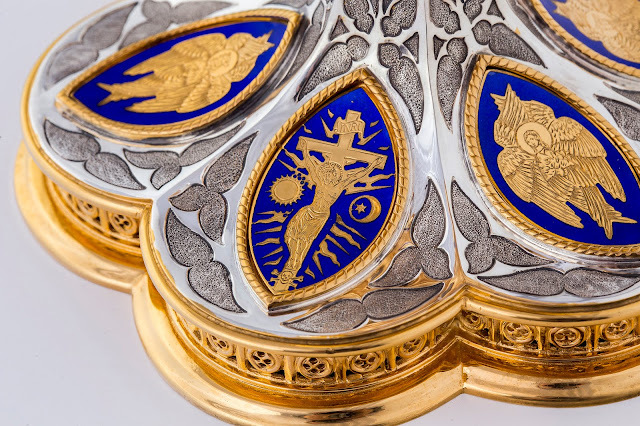 Renowned for his brilliant interpretation of historic forms to create distinct 19th century expressions of Gothic and early Renaissance styles, Pugin learned valuable lessons of his craft in a goldsmith’s studio while working in London on artifacts for the Royal Palace. In time, he put all creative energies at the service of his life’s mission, which was to revive Christian arts specifically with the view to formal use in the Catholic Church. Rev. Felix Granda (1868 – 1954) who founded the Granda workshop in Spain in 1893 worked in the spirit of an identical dedication and devoted his life to reinvigorating liturgical arts at turn of the century Spain. For this reason, Granda was especially well prepared to welcome an opportunity to engage with Pugin’s work. His designs remain a proverbial goldmine of stimuli for any designer, artist, or craftsman interested in Christian art. At the same time, sharing Pugin’s fundamental sentiments and commitment made this project a unique and esteemed opportunity to revisit his legacy and to enrich Granda’s own expertise. 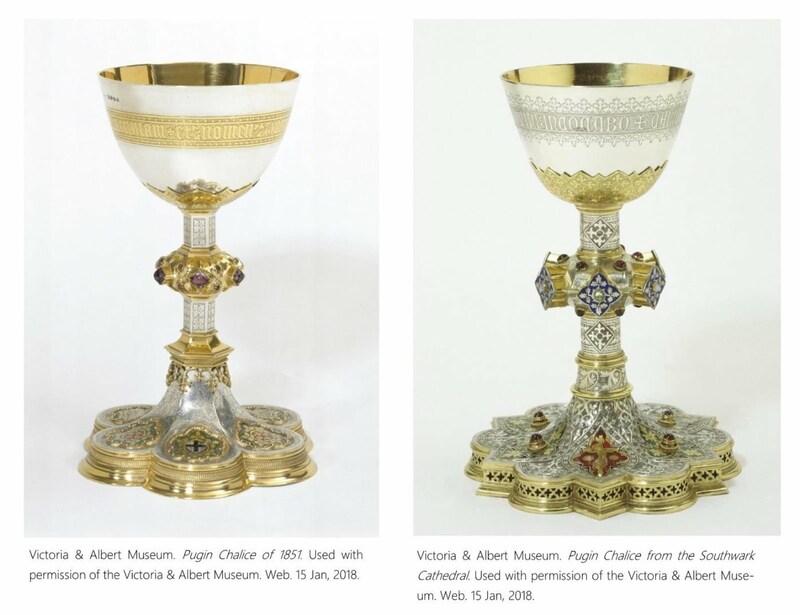 Pugin originals that served as models for two chalices and patens crated by Granda are found in the collection of decorative art objects in the Victoria & Albert Museum in London. 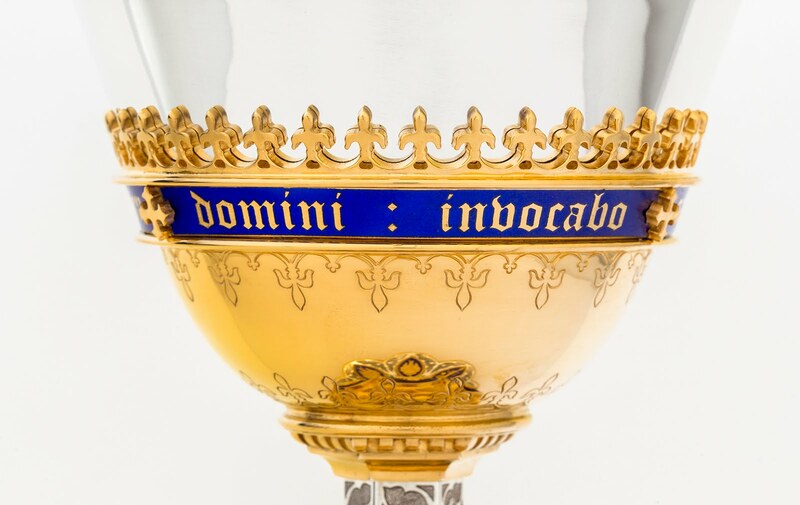 Both chalices and patens were designed by Pugin around 1850 for the Great Exhibition’s Medieval Court and were crafted by his goldsmith of choice John Hardman & Co., who carried out an impressive metalworking practice in Birmingham. Both chalices in the Museum are sterling silver, parcel-gilt, with tracery detailing, decorative engravings, enamels and precious stones. According to the fashion of the time, Pugin travelled to Italy as a young man to broaden his education. It was while touring historic sites that he was inspired by antique plate attracted his attention in significant churches along his travel route. The principal locus of liturgical craftsmanship in Renaissance Italy was Siena and it is almost certainly a Sienese model that served as a muse to Pugin’s design for the Exhibition Show. 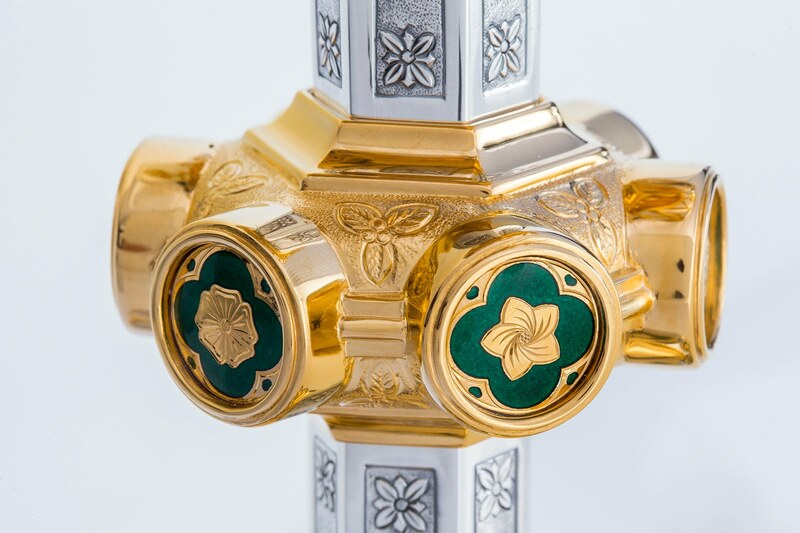 Like the Siena style chalices, Pugin’s designs bring together medieval and classical elements with a strong emphasis on decorative details such as enamels, engravings, medals, inlaid gems and rich iconography. The Sienese style chalice became an established church plate model thanks to the chalice commissioned by Pope Nicholas IV for St. Francis Basilica in Assisi at the end of 13th century. At that time, goldsmiths’ guild in and around Siena included about fifty specialists who excelled either in high craft metalworks or in painted translucent enamel decorations. The most notable difference between 13th century prototypes, 19th century Pugin models and Granda chalices is the proportion of the node to other structural components of the chalice. The prototype nodus is much larger, forming almost a globe, often enhanced with raised relief decoration and enamel plaques enshrined around it to form a collar of tondos featuring likenesses of saints. Shape of the Sienese chalice cup is almost identical with Granda’s. Pugin cups are slightly more rounded at the bottom, but generally the heads of all chalices stay in the same family of type and size, that is later Gothic. Most Sienese bases are wider than the ones in the 19th century model and decisively broader than ones designed by Granda. This feature is more in line with an inherent Gothic character of the Sienese style which favored extended lines and somewhat exaggerated proportions. 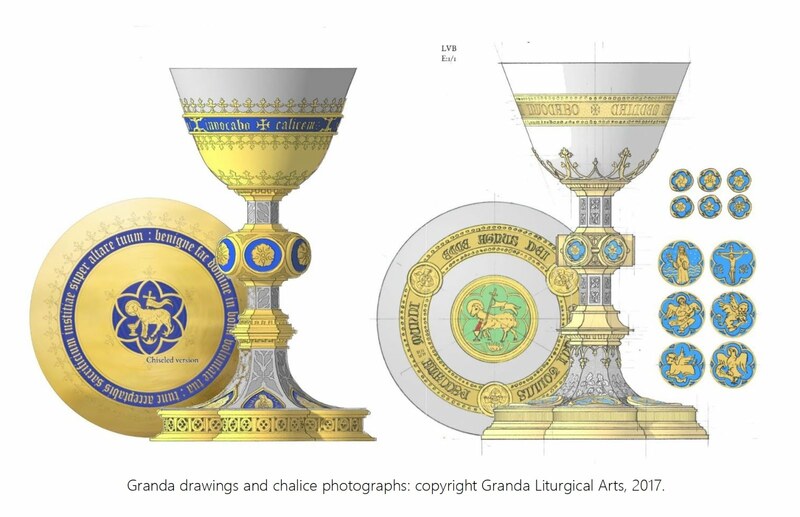 While Granda chalices are very similar to the Siena prototypes and to Pugin’s work, differences in decorative emphases and variance in transitions between planes of each chalice are readily perceivable, giving Granda plate its distinct aesthetic personality. The Green and Blue chalices are notably more compact and economical in proportions than the other models. As such, they steer more closely to the classical idiom. Balance and spatial distribution are sober, streamlined and close-fitting. Decorative details are entirely integrated into a definite and unified iconographic program of each chalice. Overall construction shows solid, stable, and substantial. The commissions for Granda chalices originated in Rome at the Pontifical North American College. Currently, both chalices are in liturgical use in the United States, one in the Diocese of Kalamazoo, MI and another in the Diocese of Birmingham, AL. Granda drawings and chalice photographs: copyright Granda Liturgical Arts, 2017. The British Museum. Siena Chalice. Used with permission from the British Museum. Web. 15 Jan, 2018. Victoria & Albert Museum. Pugin Chalice from the Southwark Cathedral. Used with permission from the Victoria & Albert Museum. Web. 15 Jan, 2018. Victoria & Albert Museum. Pugin Chalice of 1851. Used with permission from the Victoria & Albert Museum. Web. 15 Jan, 2018. Clark, Kenneth: Gothic Revival: An Essay in the History of Taste. John Murray Publishers, LTD, 1996. Robinson, James. Masterpiece of Medieval Art. The British Museum Press, 2008.